However, it would be upsetting if you were unable to go for a hike due to any foot health issues that you may be facing. Here at Foot and Ankle Associates, LLP, we specialize to provide you the best quality foot care that your feet deserve. Don’t jump into it; rather move up slowly and steadily. Hiking can be a very strenuous exercise if you have been idle or inactive for some time. Don’t opt for long and steep tracks right from the start. You may want to begin on shorter and easier routes and then move your way up. Exercise to make your lower leg muscles and ankles strong. With weak legs, chances of damaging your foot or ankles are high. Wear appropriate shoes that provide the necessary comfort, support, and stability to your feet. Running shoes may not be appropriate as they have softer soles, whereas hiking entails uneven, hard and at times rocky surfaces. Also, it is important to wear the right size of shoes to avoid toenail injuries and harm to your foot bones. Make sure there is ample space for your toes to move inside your hiking shoes. Visiting your podiatrist to take the right precautions for your feet and ankles is a wise decision. Call us at our offices located in Newark and Greenville, DE and Garnet Valley, Kennett Square and West Grove, PA to schedule your appointment with our expert foot doctors today. 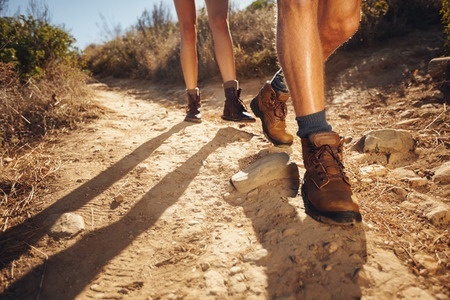 We will ensure that your feet are safe and healthy so that you can have a great time hiking with your loved ones.